Thao Nguyen is and isn't what you imagine when you think of a singer-songwriter. On her band's latest album We the Common, she finds her personal voice as an artist by speaking out for others. 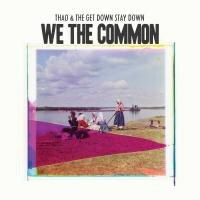 If you look really closely -- maybe too closely -- into the fine print on We the Common, you'll notice that it's credited to Thao & the Get Down Stay Down, instead of Thao with the Get Down Stay Down, as the group's previous two albums were. With a new project that's all about celebrating shared, relatable experiences, it's easy to want to read a greater sense of fellowship into that little ampersand than it typically represents, even though Thao Nguyen herself offers a much more pedestrian reason for the semantics. "Not much of a story there: I wanted to switch Thao & the Get Down Stay Down because I was tired of seeing so many letters, but we couldn't get Internet domain with '&' so we had to go with and," she explains. "But wherever we can use '&' we will use '&'. Is that the most boring thing you've ever read? I am sorry." So that slight, subtle change might not be meaningful at all, but there's no denying that We the Common reflects discernible change and growth in Thao Nguyen's outlook as an artist. Although she's most often categorized as a singer-songwriter, that thumbnail sketch doesn't tell the whole story about Thao's music, since it doesn't account for a sound that has always felt more extroverted than introverted. Sure, Nguyen may have made her mark thanks to confessional-like lyrics and the simple, precocious guitar strum of "Bag of Hammers", which soundtracked, of all things, a Clorox commercial. But even "Bag of Hammers", Thao's signature song, actually built up into something bigger and more gregarious, culminating in some stomping, front-porch jamming. Indeed, a good way to think about Nguyen's handiwork is that it's party music for people who aren't really party people: that's something Nguyen slyly hints at on her second album Know Better Learn Faster when she mumbles in an aside that "Sad people dance too," an apt enough motto for an album that coaxed wallflowers to stop sitting on their hands and to get on their feet. Thao's efforts to convey a more collaborative spirit in her music come to full fruition on We the Common, and not just because of the title. On the whole, the tones on We the Common are bolder and more vibrant, as Nguyen expands her palette with more and better utilized orchestration coming in the form of boisterous horns, swaggering strings, and jaunty synths. On songs like the fittingly titled "Every Body" and "The Feeling Kind", Thao comes off like the bandleader of a ragtag troupe or the host of a rambunctious block party, not simply a folkie strumming a song. It's probably no coincidence that such richer, fuller soundscapes have come about after her work in the past few years with likeminded pop eccentrics, like tUnE-yArDs' Merrill Garbus, Mirah, and Joanna Newsom, who appears on We the Common in the kind-spirited duet "Kindness Be Conceived". "It loosened me up because that kind of mind melding is a joy," Nguyen explains. "It gave me more perspective and broadened my vision and heightened my imagination for what could exist and co-exist. Also, all those collaborations gave me more confidence in myself and what I heard and how I could encourage and direct instrumentation to better realize what I heard." The big-tent sound of We the Common matches the collective themes announced in the title and explored in Nguyen's lyrics. While Know Better did boast a warm-hearted, embracing sound, the subject matter Nguyen examined was more individual in its focus, digging into romantic missteps and existential crises in such a personal way that they've could only have come from first-hand experience. Not so with We the Common, which is not just about how Nguyen looks to find her place with others, but actually seems to be about creating a community all her own through her music. As she describes the thematic focus of We the Common, "My intention from the beginning was to make an album full of songs that better captured the energy and hope and optimism of the collective and of one person in particular -- myself -- who wanted to be a part of that collective, and one who wanted to be more present in her own life and the lives of those she loved." That kind of inward contemplation isn't self-absorbed in Nguyen's case, but is directed outwards on We the Common. The groundwork for the new album came about at a time when Nguyen took a break from a continuous cycle of touring, performing, and recording, a hiatus that coincided with a permanent move to San Francisco. There, Nguyen looked to integrate herself with her community more, which led to her volunteering with a number of local outreach organizations. The one project that seemed to have the greatest impact on We the Common was Nguyen's work with the California Coalition for Women Prisoners (CCWP), through which she met the inspiration of the album's title track, a prisoner named Valerie Bolden with whom she struck an immediate and deep connection. As Nguyen explains, she started working with CCWP about a year ago, going on visits to California state prisons every few months to find out how to help women, for instance, advocating for healthcare or legal aid, among other things. Above all, it was the personal interaction that was the most fulfilling aspect of volunteering with CCWP for Nguyen. "Truthfully, I think the most helpful part is going in and hanging out and talking and listening. The California prison system is an incredibly inhumane place and any bit of true human recognition and respect we can pay is important to everyone involved. The women I have met are incredible and I have learned so much and it causes me great sadness to bear this kind of witness. "This work this past year has influenced my music a great deal," Nguyen continues. "It emotionally shaped much of this new record. All the ideas of collective energy and taking up for one another and showing up for people have come from my time with CCWP." When you hear Nguyen describe her album this way, the "we" in the We the Common is anything but abstract or anonymous, as she sees her first-person singular angle as inseparable from a first-person plural perspective. You notice it in the way Thao delivers the chorus of the title number, calling out "We the common do cry" and crescendoing in unbridled oh-oh'ing that begs you to join in. That "we" pops up throughout the album, whether it's when Thao breathes life into the common trials and tribulations that go with relationships on "We Don't Call" ("We don't call / We don't write / We love some strangers every night") or when she pays tribute to all those who keep on persevering on the wearied "Cloud for Brains", as she concludes simply, "We go on." With Nguyen reaching out as she does on We the Common, her "we" could just as easily refer to the characters she sketches in the songs as it does to the audience listening to her music. "Definitely, I could tell as I began writing songs for this record that they were headed in a different, welcome direction. Most of the songs I wanted to write all had to do with myself or a character wanting to be a true, breathing part of her own life, who wanted to go beyond self-imposed limitations when it came to human relationships and show up for herself and for other people. The backbone and foundation of a lot of these songs are about revival and gratitude and being better." What the songs on We the Common represent is not only Nguyen's continual development as a songwriter and musician, but also her own ever evolving identity. If Nguyen comes off more comfortable in her own skin on the album, it might have something to do with how she seems to be more aware of who she is now. Part of Nguyen embracing what it means to be an artist who is connected to something bigger than herself is appreciating her role as one of the more prominent Asian American women performers in pop music. "Being Asian American impacts the way I make music just as much as any other of my biographical elements do, which is to say I'm sure it does, but it is not overt to me," she explains. "I'd reckon the more palpable and tangible impact enters when I consider the arc of my professional career and how I choose to present myself, how I talk about my ethnicity and what responsibility I feel to that end." Working in an industry where Asian American artists are far from commonplace, Nguyen, a Vietnamese American who grew up in suburban D.C. Virginia, used to bristle when her racial identity was inevitably mentioned, because she felt "it was an easy, reductionist angle to take and had little to do with the music I made." With time and perspective, however, Nguyen has grasped what her presence symbolizes, especially in indie circles, although the matter of her Asian American identity is now rarely broached as her career has progressed. "Now it hardly ever comes up and I welcome the opportunity to talk about it," she notes. "It took a while for me to understand the importance of people of color being visible in any kind of scene. I was a bit slow on the uptake, I know. I realized that young people would benefit from seeing all different looking kinds of folks in all arenas. I would have. I grew up in the white suburbs of D.C., with very little on the palette. "And to get particular, yes, I definitely want young Asian American women to know its possible to do whatever you want, to be loud and strong, and if I can help with that then I am honored to do so." Whether Nguyen is speaking directly to Asian American women and the prisoners she works with or more broadly to the communities she lives in and her ever-growing fanbase, the way We the Common gets across its open-minded, open-hearted attitude is a real triumph. Ironically enough, it is in working with others and lending her own voice to what they've gone through that Nguyen expresses a truer sense of individuality as an artist. As Nguyen describes how becoming more a part of her community and her family impacted her music, "It made me see how lucky I was, it made me really grateful to have them. It made me really sad that I had, for whatever various reasons, not been available sooner. And I explore that a lot throughout the record -- how I am ready to be a part of my life and a part of other people's lives."